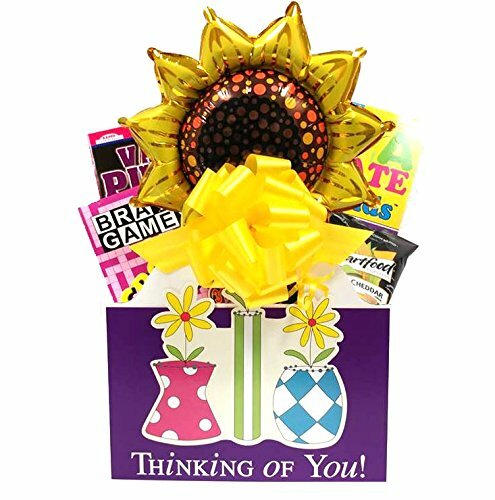 Thinking of You Gift Basket is a Cheerful Alternative To Flower Bouquets for any occasion. Gift Basket arrives wrapped and ready to give to wife, sister, grandma, friend or co-worker. Cheerful gift basket for her includes: Word Search (circle a word) puzzle book for hours of entertainment during recovery. Sudoku puzzle book has tons of easy and medium puzzles for hours of fun not frustration. Crossword puzzle book America's favorite kind of puzzle book great brain exercise. Gluten free, whole grain "Smart Foods" white cheddar popcorn a great snack. Deliver cheer with the 10" sunflower foil balloon filled with air not helium it's better than a bouquet because it lasts for months. Perfect gift for ages thirteen and older with puzzle books for all skill levels and abilities. This fun womens gift basket provides plenty of entertainment. Thinking of You Gift Basket arrives fully assembled and ready to give. It's wrapped in clear cellophane and topped with a bow then bubble wrapped and shipped in a box to the recipient. Did you know every gift you purchase does two GOOD things? First you bring joy to the recipient. Second you support jobs for people with disabilities who craft the gift baskets and care packages we sell. At Gifts Fulfilled your gift is as fulfilling to give as it is to receive! Don't forget your gift message! Check off the gift options box in the shopping cart to include your gift card message with your order. If you have any questions about this product by GiftsFulfilled, contact us by completing and submitting the form below. If you are looking for a specif part number, please include it with your message.